This Cheddar crust apple pie is made with extra-sharp Cheddar baked into the crust for a surprising savoriness that’s the perfect contrast to sweetness of the Golden Delicious apple pie filling. Compliment worthy to the nth degree. 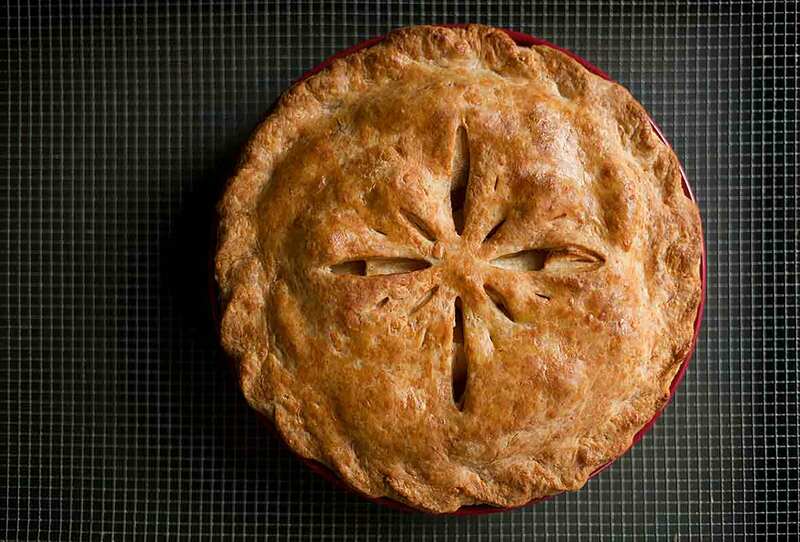 We’re about to let you in on a pie crust trick that Grandma should’ve taught you. (Actually, maybe she did.) When you’re about to divvy the mound of party dough in half—one portion for the top crust, one for the bottom crust—make the portions slightly unequal. Without delving into geometry or algebra or calculus, suffice it to say, you need a little more surface area for that bottom crust since it has to go up the sides and fold under the top crust. You’re welcome. 1. In the bowl of a food processor fitted with a metal blade, combine the flours and salt. Cut the butter and lard into small pieces, add them to the bowl, and process for 5 seconds. Add the Cheddar and pulse once or twice to mix. 2. With the motor running, pour in enough of the vinegar mixture in a slow, steady stream for the dough to form a ball. Process for 10 to 15 seconds. 3. Turn the dough onto a lightly floured work surface. If it appears too dry, work in 1 to 2 more teaspoons water. Shape the dough into a 6-inch disk, wrap it in plastic, and chill at least 2 hours (or overnight) before rolling it out. 4. Peel and core the apples and then cut them into slices 1/16 inch thick. Immediately toss the apple slices in a large bowl with the lemon juice to prevent them from turning brown. 5. In a separate bowl, whisk together the sugar, flour, cinnamon, and salt. Add to the apple slices and gently toss to evenly coat the apples. 6. Crank the oven to 425°F (220°C). Line a rimmed baking sheet with parchment paper or aluminum foil. 7. Divide the dough into 2 unequal pieces, one slightly larger than the other. (The slightly larger piece is for the bottom crust. For more information, see the note above the recipe.) On a lightly floured work surface, roll the larger piece into a round about 13 inches in diameter. Carefully transfer the dough round to a 9-inch pie plate and fill with the apple slices. Using your hands, shape the apples into a firmly packed mound slightly higher in the center than at the sides. Dot the apples with butter. Trim the edges of the bottom crust to a 1 1/2-inch overhang. 8. Roll out the remaining dough into a 11- to 12-inch round and carefully arrange it over the apple pie filling. Trim the edges of the top crust to a 1 1/2-inch overhang. Fold the top crust under the edge of the bottom crust, press together, and flute decoratively using your thumb and forefinger. Cut three 1 3/4-inch slashes in center of top crust to allow air to escape. 9. Place the pie on the rimmed baking sheet and bake for 20 minutes. Reduce the temperature to 375°F (190°C) and continue baking about 40 minutes more, until the pastry is golden brown and the juices are bubbling. No more than 10 minutes before the end of baking, brush the Cheddar crust with the egg glaze and sprinkle with sugar. 10. 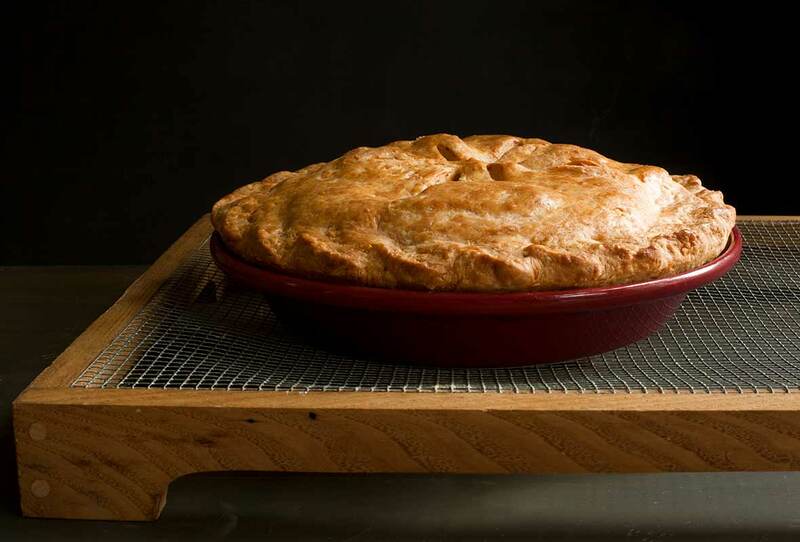 Cool the pie on a wire rack until slightly warm or room temperature before slicing and serving. 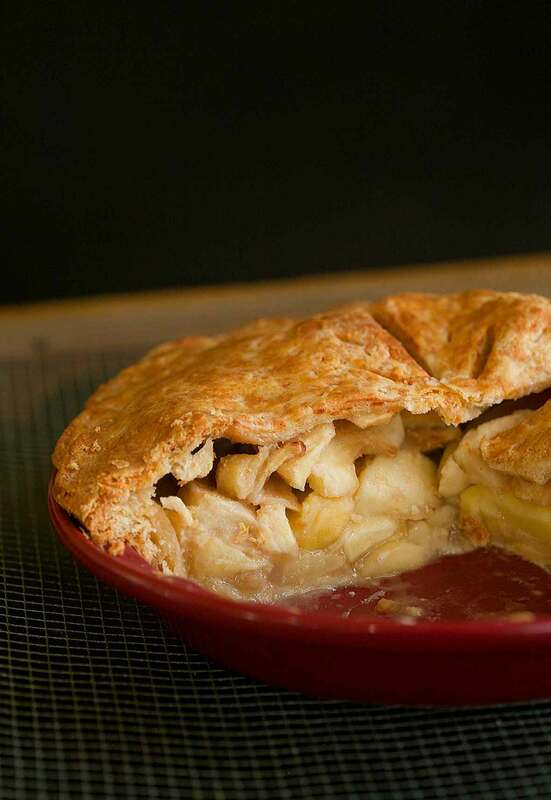 Apple Pie with Cheddar Crust Recipe © 2014. Photos © 2014 David Leite. All rights reserved. All recipes and photos used with permission of the publisher.